Neotech Soft Harness (XL Size) A saxophone harness that is not only functional but extremely comfortable! The patented weight reduction system of the Soft Harness™ uses neoprene reinforced with an elastic support system which carries the burden of a heavy instrument while enhancing the musician's freedom of movement. Musicians no longer have to be restricted by confining harness designs. 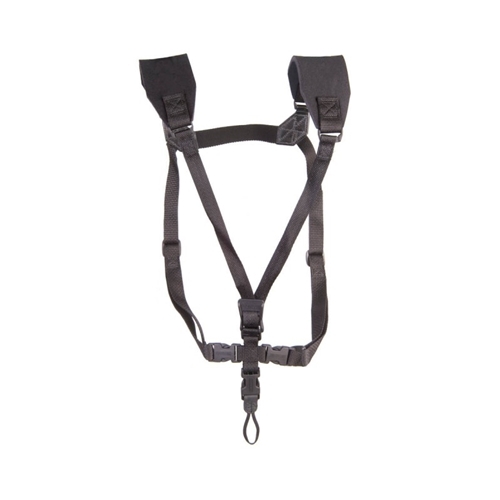 The Soft Harness™ is ideal for musicians in marching bands or individuals with back or neck problems. Available with our popular swivel hook or a nonmarring tubular nylon connection system that offers an alternative to a traditional hook attachment. The loop connector is extremely strong, yet easy on the instrument's finish.